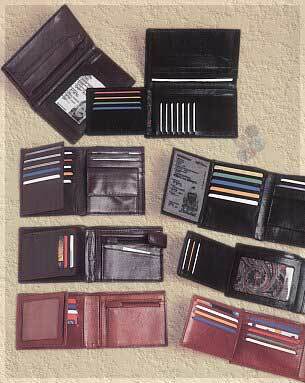 Expectedly, leather wallets -- also referred to as billfolds and note cases -- are the most diverse range in our catalogue. The illustrations show a selection. Wherever possible, the style code and dimension, in cm, is shown next to the product. Where more than one set of dimensions are noted, the second set measures the wallet when open. Details of the four wallet, shown together here in the illustration, are in the order of top to bottom. PF-4A : A classic leather wallet produced out of the vegetable tanned Cow and Buff hides. It has one deep note compartment, twelve card slots, a transparent window for the driving license, three side pockets and a zip for coins. A small pocket is also provided on top of the coin pocket. DL-55A : A leather note case wallet with a difference. Instead of the traditional zip pocket for coins, we have a press button pocket. It has two deep note compartments and two side pockets. In addition to the ten card slots, there are two side pockets and two deep pockets on top of the coin pocket. MF-107 : A beautifully crafted billfold. It has two compartments to keep currency notes, a zip pocket for the coins, six slots for credit cards, a transparent window for personal use and a side pocket beneath the coin pocket. A press button closes this bill-fold. EM-12 : An elegant billfold made in Cow and Buff hides. As you open the wallet, the mesh displays your driving license. Behind the mesh flap is space for 9 card slots and a separate pocket. There are two note compartments for currency notes and a zip pocket for coins. These styles are grouped into sets. Click on the links to view the illustrations in the set.